During my very short stay in Montréal, a lot of people mentioned this coffee shop located on Mackay street as the epicenter of good coffee and I ended up going twice, just to make sure they were right. Café Myriade is located on Mackay street between Ste-Catherine and Maisonneuve right in the heart of the Bishop University neighborhood. It’s pretty much a smallish island in a sea of Tim Hortons, Second Cup and Starbuck. It’s exactly the kind of place I could hardly find 4 years ago when I left for Japan. The shop like I just said is pretty small and on both visits, the terrace and the inside tables were packed. When I was there, they had coffee from 49th Parallel, Handsome roaster from LA and Heart from Portland. It’s interesting to see all these roasters side by side despite the fact that I can’t taste them all. On my first visit, I drank a latte which was made on a beautiful Mirage Triplette espresso machine. The coffee was quite good, it looked good and I can’t say anything bad about it, they know how to use their machine! On my second visit, I wanted to try their siphon since they were one of the first to introduce siphon to Montréal. Café Myriade also offers Eva Solo, french press and regular filter coffee. The coffee was expertly made and brought right at my table. I ordered a 49th Parallel coffee which came from Columbia, sorry, I forgot the exact name. 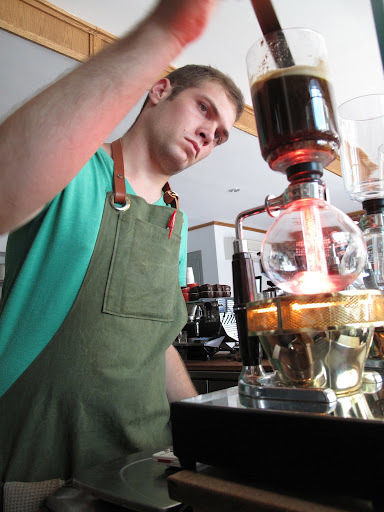 The coffee was a typical siphon, very clean and honest taste. The coffee had a nice acid touch and was very different from what I normally drink in Japan. If Café Myriade is indeed responsible for the current high quality coffee shops popping around town, people should be very grateful. It’s a mandatory visit on any coffee pilgrimage. The service was also very friendly and they really know a lot about coffee, I now wish I had bought the books they were selling about coffee.